For final year undergraduates, postgraduates, and research workers in theoretical physics and physics. Fundamental principles of theoretical physics; The Gibbs distribution; Ideal gases; Solids; Non-ideal gases; Solutions; Chemical reactions; Fluctuations; Surfaces. This is a masterpiece of theoretical physics. It is rigorous, succinct and to the point. The text explains very clearly the fundamental concepts of statistical physics in a self contained manner. 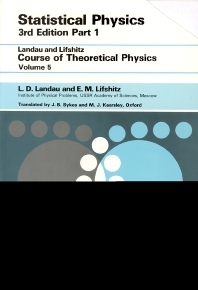 This textbook is useful to the understanding of other texts of the course of theoretical physics by Landau and Lifshitz. I strongly believe this book is an essential reading to both theoretical and experimental physicists.